Difference between revisions of "Elite"
An ''Elite'' is a monster type in Diablo III. * ''Were you looking for [[Elite_(Items)|information about elite items]]? Elite monsters are any monster which have special attributes not normally found on their base type. [[Champions]], Rares, and also [[Superunique]] monsters are all considered "elite". The term is a categorical definition which ties into some of the gameplay systems. As an example, some [[item]] [[modifiers]] increase damage to elite monsters by a specific percent. Elite kills are tracked in the player's [[armory]] as well as [[achievements]] for killing a specific number and type of elites. Once a player reaches level 60, they are granted a [[buff]] called [[Nephalem Valor]]. In brief, this buff is received whenever a player kills a rare or champion elite pack, and it grants them passive bonuses to [[Magic Find]] and [[Gold Find]]. This buff stacks up to five times. When the player has the buff on, they will receive more loot from [[quest]] boss [[superuniques]]. The amount of bonus loot is determined by how many valor stacks the player has accumulated. The buff lasts for thirty minutes, and is refreshed upon killing an elite pack. 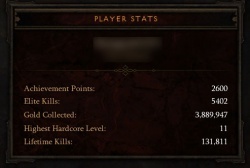 Killing elites for the buff, and then finishing it off with a quest superunique kill, comprises the [[end game]] in Diablo III. As an example, shown in the image below, it isn't uncommon to spawn two different elite packs in one small area within the [[Halls of Agony]]. The image depicts a rare cultist pack spawn in addition to a champion berserker spawn. Also, the mid-western side of the [[Desolate Sands]] zone is particularly deadly, with three or more elite packs spawning at once not being an uncommon sight. An Elite is a monster type in Diablo III. Were you looking for information about elite items? Elite kills tracked in a player's armory. Elite monsters are any monster which have special attributes not normally found on their base type. Champions, Rares, and also Superunique monsters are all considered "elite". The term is a categorical definition which ties into some of the gameplay systems. 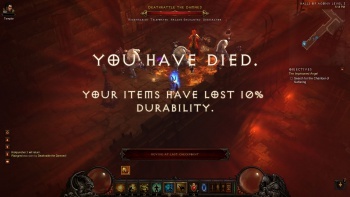 As an example, some item modifiers increase damage to elite monsters by a specific percent. Elite kills are tracked in the player's armory as well as achievements for killing a specific number and type of elites. Elite packs have variable health. Elites have special attributes which are called Boss Modifiers. Note that for Superunique types, these modifiers are not shown, although with champions and rare elites, the special attributes will be visible underneath the monster's nameplate at the top of the screen. The type and amount of modifiers an elite can have will vary by difficulty and mlvl. An example of this is the knockback modifier, which is present starting around mlvl 4 in normal difficulty. As the player reaches higher difficulties, a larger pool of modifiers will be available to elites, as well as the amount of modifiers an elite can spawn with. In normal difficulty, an elite can spawn with one boss modifier (although superuniques, covered below, are an exception to that rule). In Nightmare they can spawn with two modifiers, three in Hell, and finally four in Inferno. 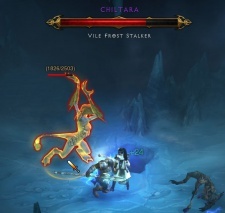 There are three types of elite monsters in Diablo III. Superunique monsters have their name displayed in purple. They vary drastically from the other forms of elites in a few ways. Superunique monsters have fixed spawn locations, but they normally have a low chance to spawn (unless they are quest-related superuniques such as the Skeleton King). They do not come in packs, have set boss modifiers, and also do not count towards a stack of nephalem valor. Set modifers means that superuniques cannot take on a larger number of modifiers in subsequent difficulties. If a superunique spawns with only mortar, as an example, it will spawn in normal or inferno difficulty with only mortar as well. Their modifiers are native and static. For this reason, superuniques tend to be much less deadly than their rare or champion counterparts. 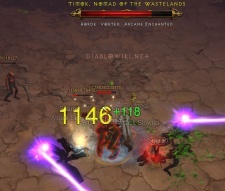 All quest monsters, including Diablo, are considered superunique. Elite rares have their name displayed in yellow. Rares differ from champions and superuniques in that there is one "boss" monster who has more health and deals more damage than their minions, and there are also certain modifiers which can only spawn on rare-type enemies, such as horde or illusionist. It is often the case that the boss monster in a rare pack has special properties that the minions do not share, due to concerns of game balance in higher difficulty levels. As an example, in a rare pack, only the boss will be able to be harmed with the Invulnerable Minions modifier, and only the boss will be able to use the jailer ability. Rare monsters count towards the nephalem valor buff, but only the boss kill counts. The minions do not refresh or add to a valor stack. Similar to rare elites, champions have some specific modifiers like Health Link and Fire Chains. A champion's name appears in blue, and in addition their models and textures also have a bright blue glow to them to separate them from the rest of the monsters. 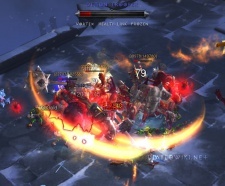 Champion packs usually revolve around mechanics such as fire chains which require the monsters to work in tandem, as a team, to attempt to kill the player. There is no "boss" monster in a champion pack. Champion monsters count towards the nephalem valor buff, but only once all of the champions in a pack have been killed. It is worth noting that there are set locations for an elite to spawn, whether it is a rare, champion, or superunique. However, D3 has no internal rules on how many spawn points can actually spawn an elite pack, which lends much more danger to certain areas than others. As an example, shown in the image below, it isn't uncommon to spawn two different elite packs in one small area within the Halls of Agony. The image depicts a rare cultist pack spawn in addition to a champion berserker spawn. Also, the mid-western side of the Desolate Sands zone is particularly deadly, with three or more elite packs spawning at once not being an uncommon sight. A double spawn in Inferno difficulty.